England whitewashed West Indies with a crushing eight-wicket win in the 3rd and final T20I played at Warner Park, St Kitts on Monday. For the 2nd successive T20I match in a row, England bowled out West Indies for a paltry total and then chased down the target with ease. West Indies captain Jason Holder won the toss and decided to bat first. David Willey got the team off to a great start as he took the Shai Hope on the very first ball. He then took the wickets of Hetmyer, John Campbell and Darren Bravo. At the end of 6 overs, West Indies were reduced to 30 for 4. After the power play overs, the hosts kept losing wickets at regular intervals. Jason Holder and Pooran were dismissed for 11 runs each. England finally bowled out West Indies for a paltry total of 71 runs in 13 overs. For England, David Willey was the pick of the bowlers with 4 for 7 in three overs. Mark Wood took three wickets while Rashid took two. Chasing the paltry total of 72 runs to win, England openers Jonny Bairstow and Alex Hales gave the team a steady start adding 28 runs for the opening wicket in 4.3 overs. Alex Hales was dismissed for quick fire 20 off 13 balls. At the end of 6 overs, England were 40 for 1. Jonny Bairstow was dismissed for 37 by Bishoo when the score was 60. Eoin Morgan finished the match with a six and a four. England won the match by 8 wickets and 57 balls to spare. 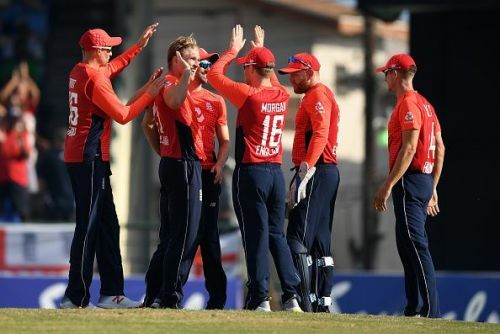 Brief scores: England 72 for 2 in 10.3 overs(Jonny Bairstow 37, Alex Hales 20, Jason Holder 1/19, Bishoo 1/11) beat West Indies 71 in 13 overs (John Campbell 11, Jason Holder 11, David Willey 4/7, Mark Wood 3/9, Adil Rashid 2/18) by 8 wickets.